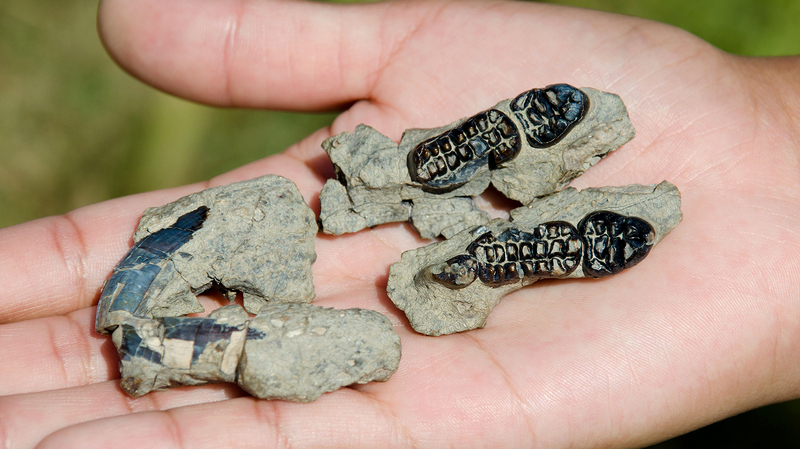 Carissa Raymond (right) holds fossilized teeth of a multituberculate mammal, a small rodent-like creature that lived at the end of the dinosaur’s era. During summer 2014, Raymond found a similar fossil later identified as a previously unknown multituberculate species while on a dig in New Mexico. Ross Secord (left), associate professor of earth and atmospheric sciences, led the dig. During her first fossil-hunting trip, University of Nebraska-Lincoln student Carissa Raymond found a specimen of a previously unknown mammal species from about 65 million years ago. Raymond, a junior geology major from Seward, was one of three students recruited by UNL paleontologist Ross Secord to assist with fieldwork in the San Juan Basin in New Mexico in 2014. Three or four days out, she spotted several strange black teeth lying exposed in the grit of an area known as Kimbeto Wash. The teeth had cusps arranged in rows resembling kernels on an ear of corn or the teeth of a meat-tenderizing mallet. They were characteristic of multituberculate mammals, rodent-like creatures that lived with dinosaurs for more than 100 million years. They survived the dinosaur extinction only to die out about 40 million years ago. It was the first new multituberculate mammal — “multituberculate” refers to the multiple rows of cusps found on the animals’ teeth — to be found in the San Juan Basin in more than 100 years. Project leader Thomas Williamson, curator at the New Mexico Museum of Natural History and Science, said he knew almost immediately Raymond had found something special. Along with jaws from both sides of the head containing molars and premolars, Raymond found front incisors and part of the brain case. Although fossils of a multituberculate species called Taeniolabis are common in certain rocks in the area, this specimen was found in an older bed. It was somewhat smaller and its teeth appeared too different to be the same species. 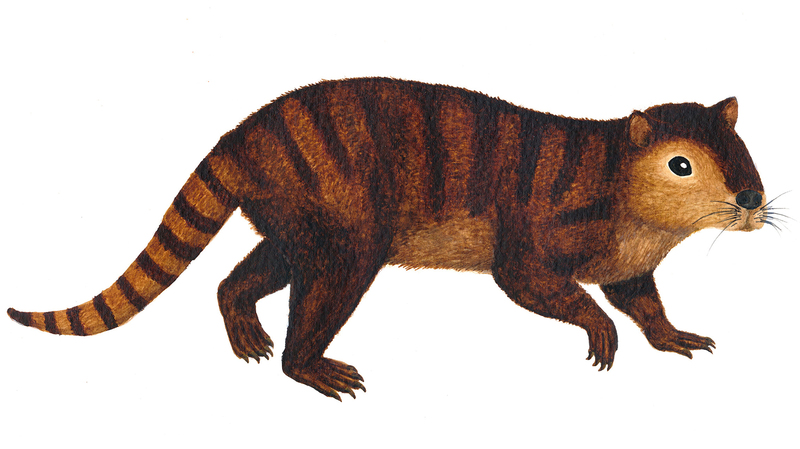 After comparing the new fossils with others from around the world, Williamson, Secord and colleagues at the University of Edinburgh concluded Raymond had found a new species, which they named Kimbetopsalis simmonsae, after the wash where it was found and a scientist who has studied the mammals. The newly identified species is described in an article published online today by the Zoological Journal of the Linnean Society. The article acknowledges and thanks Raymond for her discovery. “I knew it was cool — but not this cool,” Raymond said of her find. Secord, an associate professor in the Department of Earth and Atmospheric Sciences and curator of vertebrate paleontology at the University of Nebraska State Museum, said Raymond has a great eye for spotting fossils. Secord and Williamson are now working on a National Science Foundation-funded project to analyze how mammals have changed through time and to identify sudden changes related to climate shifts. Williamson is a vertebrate paleontologist who specializes in the early Paleocene epoch, while Secord is a vertebrate paleontologist and geochemist who uses stable isotopes to reconstruct ancient ecosystems and investigate the effects of climate change. NSF funds provided support for students to help with fieldwork who otherwise would have needed to work summer jobs. Stephen Brusatte and doctorate student Sarah Shelley of the University of Edinburgh’s School of GeoSciences also took part in the research. Other financial support came from the Marie Curie Foundation, the Natural Environment Research Council and the U.S. Bureau of Land Management. Multituberculates survived into the Cenozoic era, growing bigger in size after non-‭avian dinosaurs went extinct about 66 million years ago. The specimen Raymond ‬ ‭found was about the size of a beaver and may have been an evolutionary ancestor of ‭the bigger-sized ‬ ‭Taeniolabis‭. They may have been out competed by rodents, which ‭emerged 57 million years ago. Reconstruction drawing of a Kimbetopsalis-simmonsae. 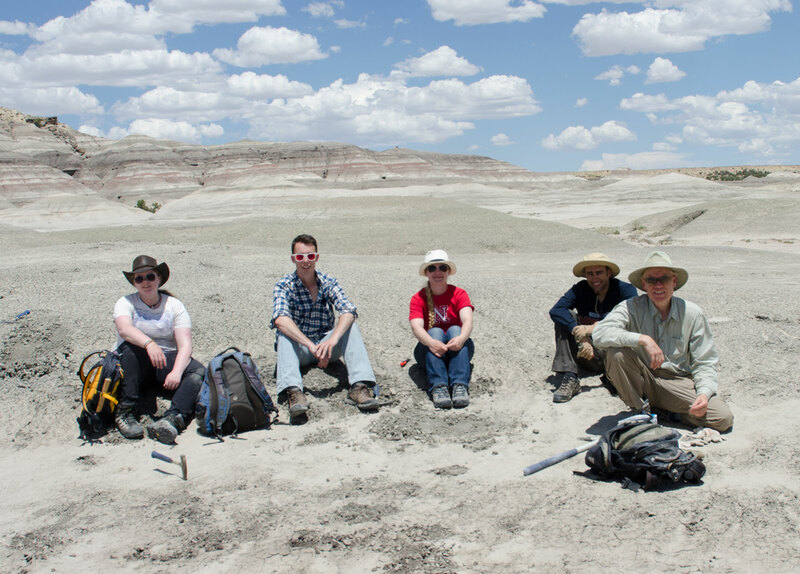 The UNL team at the dig site in New Mexico's San Juan Basin in 2014. The Kimbetopsalis-simmonsae teeth found by UNL's Carissa Raymond included incisors (left) and molars (right).